Looming over Pompeii is Vesuvius – the volcanic mountain visually dominates the ruins of the ancient city. While Vesuvius is known to have erupted more than fifty times (and maybe again soon), one eruption stands out among the rest. That is the 79 A.D. event when Vesuvius destroyed the city of Pompeii with a blanket of volcanic ash and super-heated rocks, both destroying and preserving the city. Now, visitors can see the art, homes, shops, and even casts of human beings and animals who were entombed in a volcanic ash. There is truly nothing else like it in the world. 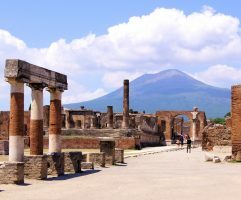 The easiest way to accomplish your visit is by private driver directly from your accommodations to Pompeii, followed by a nice lunch and a stroll in Sorrento or a classic pizza in Naples. The private driver can organize a guide for Pompeii and reserve a restaurant for you, too. Vary the itinerary to include, according to your interests Amalfi, Positano, Vesuvius or the dock for the hydrofoil to Capri. Contact Rocco at Rome Value Transfer for a quote for his excellent service: [email protected]. An approximate schedule would be to leave Rome at 7:30am visit Pompeii, lunch and wander about Sorrento, returning to Rome about 4:30-5:00pm. Be sure to tell him Italy Perfect sent you. 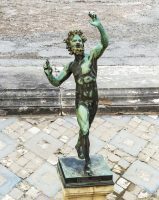 A guided tour that offers a van or bus from Rome to Pompeii is also easy and a good value. You may need to go from your Italy Perfect vacation apartment to a nearby hotel to meet up. It is a care-free trip with the benefits of a knowledgeable guide. For independent travel, trains run daily and the average trip is two hours each way – a pleasant cruise through Italian countryside. Take an early train from Roma Termini to Naples* and when you arrive, go downstairs to the Circumvesuviana local train service for the next train to Pompeii. They run about every half hour; buy your Circumvesuviana train ticket at the automated kiosks on the lower lever, you don’t need to book ahead. It is a local, second class train with students and workers aboard. There are two Pompeii train stops, get off at “Scavi” (excavations) rather than the town of Pompeii itself. The same train can take you onward to the station in the center of Sorrento where there are many nice restaurants. We recently enjoyed lunch at the Sacro & Profano restaurant that was very nice. *Naples is know for its pick-pockets. Just be smart, purses bandolier style, jewelry hidden, wallets in front pockets. If on your own, we suggest getting an audio guide, or hiring a guide, usually there are several available at the entrance to the ruins. There is no argument over the “best thing to see” in Pompeii: the ruins. Plan to spend a at least two hours wandering and taking in the scenes. For grandeur visit the Amphitheater and the House of the Faun. The entire tragedy becomes personal in the the Garden of Fugitives of Pompeii. Here visitors can see the remains of the people who perished in the eruption. While the ruins are the site to see, there is more to Pompeii. The Shrine of Our Lady of Pompeii rivals the country’s more famous Duomos, and then there is the food. While Pompeii does not have a cuisine of its own, there are numerous great places to eat. Trip Advisor recommends Bevimm, a classic Italian deli with a twist: vegan options. For a taste of the region, Lo Chalet di Mirko sells bottles of Limoncello and Meloncello – the perfect finish to any meal, or any day trip!